BEFORE: With some better planning, these next three films in the marathon could have had even more connections, but alas, they don’t. Starting with today’s The Company Men the next three days will feature Ben Affleck. The better planning I was referencing was having this chain take place after School Ties where Affleck had a minor supporting role and the chain could have also connected with the Invictus which featured childhood friend Matt Damon. But that’s the past, now it’s time for The Company Men. AFTER: The Company Men tries to be a definitive look at the recent economic recession and the effects it has on three high level executives at the fictional corporation, GTX. And it certainly puts up a strong fight but ultimately falls short of being that final say of what things are like. The main focus is the wealthy, high-level executives but the blue-collar class is also represented. 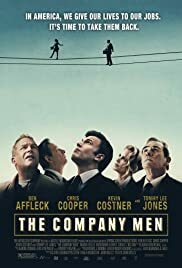 For the executives you have Bobby Walker (Ben Affleck), Phil Woodward (Chris Cooper - last seen in Capote), and Gene McClary (Tommy Lee Jones - last seen in Lincoln) each of which focus on a slightly different perspective. Walker is the first to lose his job and while he struggles with this monumental change eventually accepts that he needs to change his lifestyle. Woodward is the person who is in denial and can’t change despite having lost his job. And then McClary is the second-in-command at GTX who is unlike many executives you’ll read about in the papers; he genuinely cares for his employees and feels guilty when good people are being laid off. Representing the working class is Walker’s brother-in-law Jack Dolan (Kevin Costner - last seen in Field of Dreams) and is a great example of how hard work can pay off. The characters and their actors were fantastic in this film. Tommy Lee Jones especially continues to surprise me and has now made it onto the list of “I’ll see that movie if he’s in it”. But there was something holding the film back and that was the development and exploration of these characters. The Company Men tries to do something many people would consider impossible; create sympathy and empathy for the 1%. Well the impossible is challenged and is almost overcome by this film. You see a side of executives that you wouldn’t see anywhere else (maybe because it’s fictional but I believe at least a select handful of real executives have the compassion of McClary) and you get inklings of sympathy, and empathy, for them. But it’s as if the director, John Wells, held back and only gave 80% instead of the full 100%. As a result, The Company Men falls a bit flat of the defining label for the recent recession. There’s still a lot of good in the film and many reasons to watch it (each member of the cast is one reason by themselves). If you enjoyed Up in the Air chances are you’ll also enjoy The Company Men. There’s a lack of social commentary present in The Company Men something which I feel makes it inferior to Up in the Air but that alone is not enough of a reason to downgrade The Company Men. It’s a good drama and a good choice for a movie night.